Hello and welcome! I am an amigurumi (crochet stuffed animal) pattern designer currently living in Montreal, Canada. 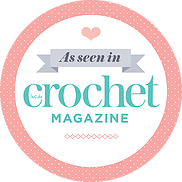 My goal with hookabee is to create amigurumi patterns that are a joy to make for people of all levels of crochet. I started crocheting in early 2013 after seeing all the cute creatures I could make with simply a hook, some yarn and a bit of stuffing. While I do crochet items other than amigurumi, they are my primary joy. Now I design my own amigurumi patterns – patterns I take great pride in making easy to understand and follow. All my patterns include detailed instructions and step-by-step photos. They have all been thoroughly edited and tested before being released. If you have any questions about my patterns (there are no silly questions!) I want to help. Just send me a message below and I will provide assistance. Subscribe to my amigurumi newsletter to receive special emails with fun interviews, links, and updates.